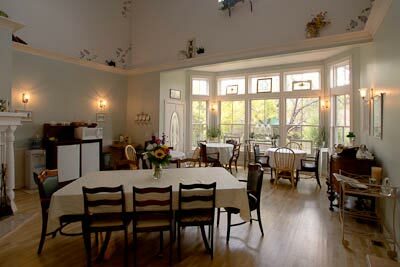 Located in the heart of Cedar City, Utah, The Iron Gate Inn (435-867-0603, www.theirongateinn.com) is a very relaxing place to hang your hat. It’s housed in an 1897 building that’s been completely re-done; and gladly innkeepers CR and Susan Wooten took access into account during the renovations. “I wanted to have an accessible room, because my father was in a wheelchair and I remember how hard it was for him to find truly accessible accommodations,” says Susan. And indeed Susan did a good job of learning what actually makes a property accessible, and incorporating those features into her nine-room inn. 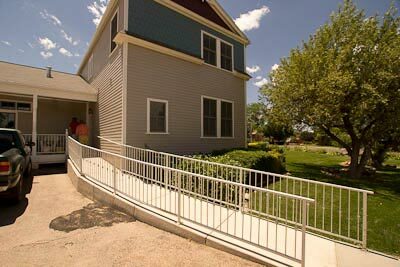 Although there are steps up to the front door of this historic property, ramp access is available from the parking area. And CR and Susan will happily reserve the space closest to the ramp for slow walkers. Just let them know that you need that accommodation when you make your reservation. Inside, there’s barrier-free access throughout the tastefully decorated home, with plenty of room to maneuver a wheelchair. It’s not cluttered like many historic B&Bs, and the clean lines give it a very modern feel. The accessible Grace Mary Room, which is located on the first floor, features wide doors, wood floors and good pathway access. 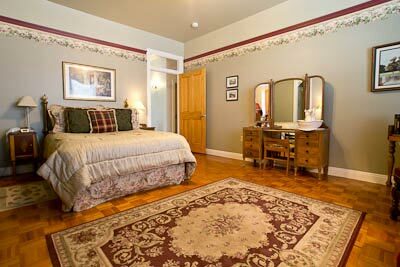 It’s furnished with a 25-inch open-frame queen-sized bed, with good wheelchair access on both sides. The bathroom features a full five-foot turn around and is equipped with a roll-in shower with grab bars and a hand-held showerhead. The toilet grab bars are located on the back and right walls (as seated), and the bathroom also has a roll-under sink. And if you need a portable shower chair, just let Susan know when you make your reservation, and it will be in your room when you arrive. There’s good access to the public areas of the inn, including the breakfast area, where Susan serves up a yummy meal every morning. Breakfast usually consists of an entrée such as quiche, strata or naked french toast, accompanied by fresh fruits, breakfast meats, baked treats and breakfast beverages. And in the summer months, you can also enjoy breakfast on the patio. And if you’d like to do a little wine tasting while you’re in town, Utah’s newest winery is located just across the parking lot. Winemaker Doug McCombs opened the doors to the Iron Gate Winery (435-867-9463, www.igwinery.com/) this spring. There’s level access to the winery, plenty of room to roll around inside, and a large accessible bathroom. Doug features a wide range of wines to choose from including Riesling, Chardonnay, Viogner, Roussane, Cabernet Sauvignon, Tempest (red blend), Syrah, Mourvedre, Tempranillo and Zinfandel. And although you can certainly taste wines at this location, it’s located too close to a church to be a retail outlet. Doug solved that problem nicely, as he opened up a small store for retail transactions just down the block. It’s only a short walk, and although there’s a small step up at the entrance, the employees are happy to bring your purchase out to you. As an added bonus, when you’re a guest at the Iron Gate Inn, you’ll be treated to afternoon wine on the patio. And that’s reason enough to visit the inn. Additionally, it’s just a few blocks away from the venue for the Utah Shakespeare Festival, which takes place during the summer and early fall. 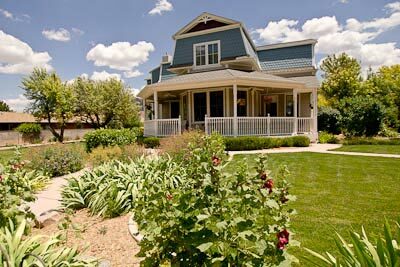 Whatever your pleasure, the Iron Gate Inn is a very comfortable and accessible place to stay in Cedar City.